Our organization is placed among the noteworthy organizations, engaged in manufacturing and supplying an excellent quality Flush Tower Bolt. Available in: 4", 6", 8", 10" with silver finish. It is widely used in windows, doors, etc. 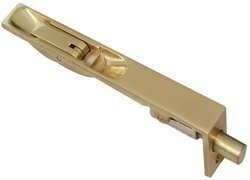 Incepted as a Sole Proprietorship firm in the year 2006, we “Amit Sales Corporation” are a foremost firm engaged in manufacturing and supplying a comprehensive assortment of Brass Electric Parts, Brass Knurling Inserts, Brass Glass Fittings, Brass Tower Bolt, SS Door Windows Fitting, etc. By practicing quality-oriented approach, we manufacture these products precisely as per the set quality norms using top grade raw material and advanced techniques. These products are highly applauded for their features such as easy installation, high strength, fine finish and durability. Located at Jamar (Gujarat, India), we are backed by an ultra-modern and well-structured infrastructural base that assists our experts to manufacture a flawless array of products as per the industry set norms. Under the direction of our mentor "Mr. Rajahs Shah", we have carved a niche for ourselves in this challenging market.